We focus on handling all your automotive workshop and showroom cleaning requirements, so you can focus your resources on other aspects of your business. With our advanced technology and chemicals, you can enhance your efficiency, profitability, and production. We have a wide range of equipment specifically designed for the automotive industry. We are truly a one stop shop for the Automotive Industry. 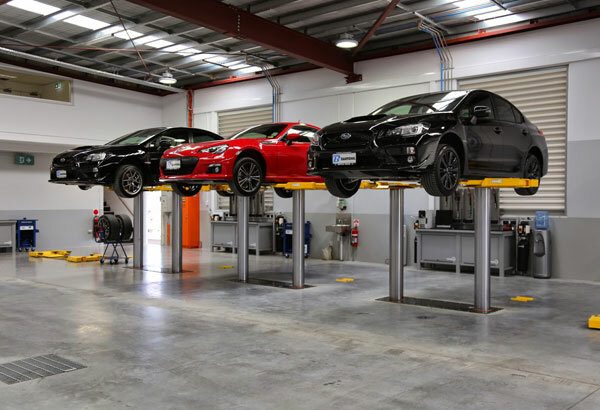 The appearance, safety, and productivity of your car are all important features, so why should your automotive workshop space be any less important? From cleaning retail showrooms to heavy-duty equipment, Alphaclean is truly a one-stop-shop for the automotive industry. 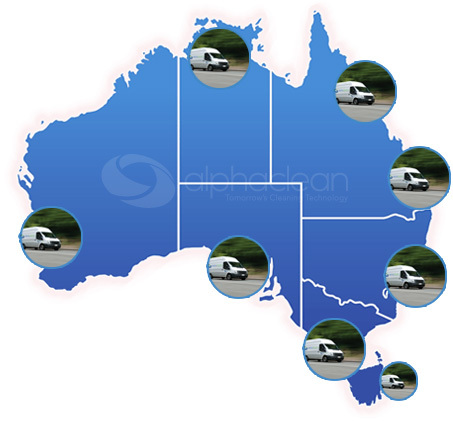 At Alphaclean, we have a wide range of equipment specifically designed for the automotive industry. Additionally, we service most brands of cleaning equipment and have preventative maintenance options for most requirements to increase productivity, while reducing downtime on your machines. While working with large and potentially dangerous machinery in a workshop, it is important to keep the area clean and up to standards. Not only is it important to legally maintain these standards, but an unpolluted workspace prevents potential injury as well. Oil and grease are particularly stubborn substances to remove, and can be unsafe when walking around a workshop. With our line of scrubbers, you can scour these tough messes with ease, keeping your environment safe and clean. When prospective customers enter your retail shop or even when they park outside, the first thing they will notice is the appearance. First impressions are everything and the cleanliness of a business is no exception. A tidy showroom will ensure that your clients are focusing on the automobiles. In contrast, a dirty area will turn customers off and question the competency of your business. 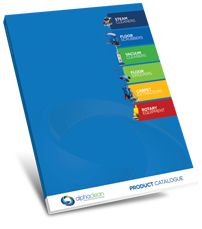 Investing in quality showroom cleaning equipment is crucial in attracting and keeping clients. Ensuring the car parking and open space areas around your business is also important in maintain a prestige image for you customers. A clean parking lot also prevents potential accidents or dangerous situations for both drivers and those walking. Running the business side of a successful Automotive and Workshop Industry can be high-paced and time-consuming. Alphaclean can increase efficiency in the workplace and reduce time spent on cleaning, so you focus on others aspects of your industry. Having properly cleaned and functioning machinery is important to run a thriving workshop and showroom. Alphaclean has a wide-range of cleaning equipment expressly designed for the automotive industry, including a variety of: scrubbers, sweepers, vacuums, and steam cleaners, polishers/rotaries. There is training and consultation available for the machinery to ensure that you are getting the most out of your cleaning equipment. Check out some of our top products for the automotive and workshop industry that are guaranteed to fit your company’s needs. 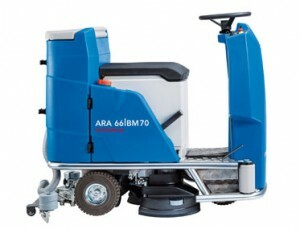 Scrubbers and sweepers are especially important machines used to maintain a safe and sanitary work environment. A strong scrubber will clean many different types and sizes of flooring to combat grease, oil, dirt, and tire marks. The Alphaclean line of industrial machinery contains a variety of types, sizes, and power, which can be used by any workshop or showroom. 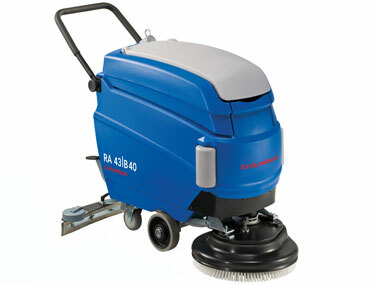 The Columbus RA66BM60 multi-application scrubber is perfect for locations with heavily soiled floors. 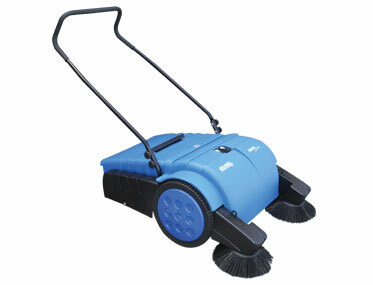 It has an adjustable brush pressure of up to 60 kg, and powerful suction to ensure a clean finish. 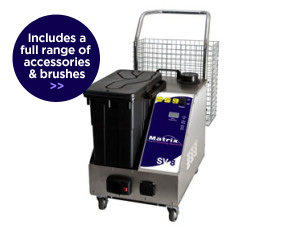 The adaptive brush system details the floor with its high-pressure, working well on both flat and uneven floors. 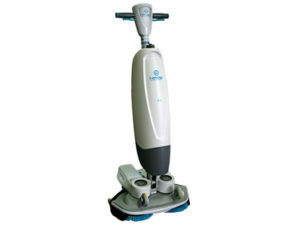 From medium to large surfaces, this scrubber can thoroughly clean them all with ease. With a SureSweep STR1100 HD, you will effectively be able to clean up large rubbish while also disposing of the debris easily. 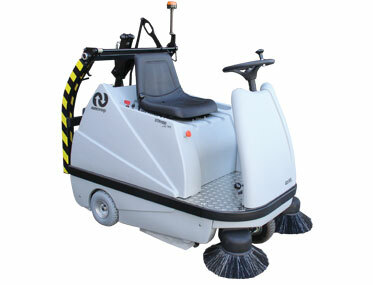 This ride-on sweeper features a double row of brooms that cleans more, saving you both time and money. 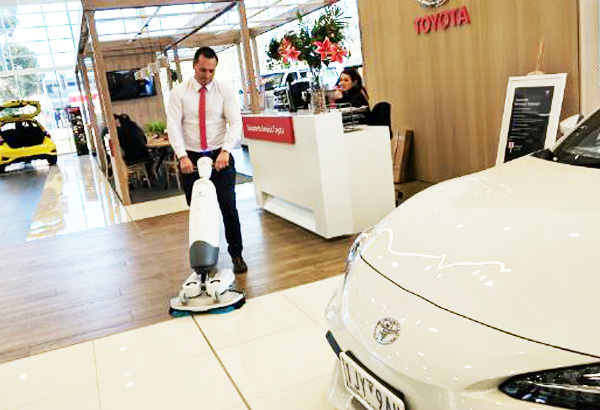 Its smooth ride can be used on a wide range of surfaces from indoor carpets to tackling outdoor parking lots. With the high performing suction system, you will not only clean the floor, but also prevent dust and pollutants from discharging into your work environment. From large industrial garages to smaller car dealerships, we have powerful tools to tackle the tough grime, grease, and debris from your floors. Our cleaning supplies are easy-to-use and come with training, so that you can maintain a sparkling and secure automotive environment. Alphaclean offers cleaning systems and equipment specially created for both professionals and customers in the automotive world. 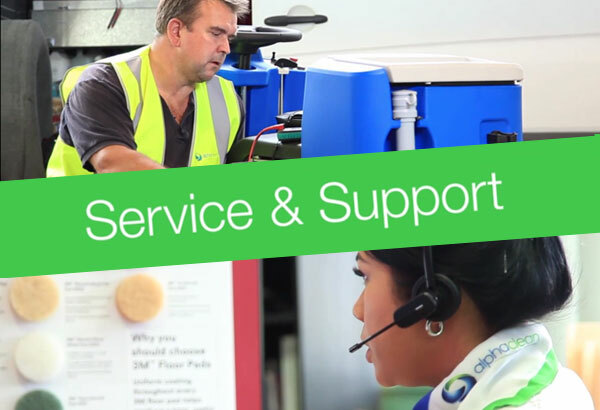 We understand the high standards and needs of this fast-paced industry, so we continue to provide effective cleaning machinery that ensures quality results for our clients. With our advanced technology and machinery, you can enhance your business’s efficiency, profitability, and production.